Once upon a time, there was a very lucky girl who decided to review cookbooks. All of a sudden her mailbox (I’m talking the retro snail mail kind of mailbox), was full of amazing, exciting, ridiculously fun (nerd alert! ), vegan cookbooks. 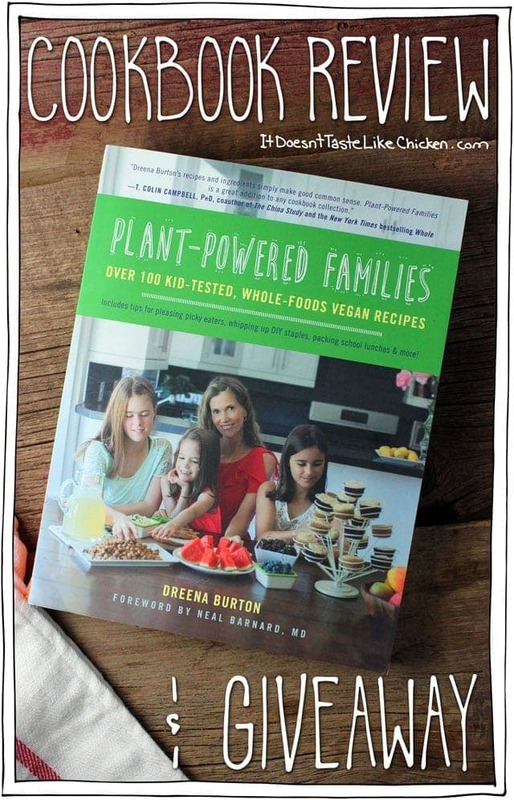 The next cookbook up for review is Plant-Powered Families by Dreena Burton. You may know Dreena from her blog Plant-Powered Kitchen or perhaps you already own one of her earlier cookbooks Let Them Eat Vegan!, Eat, Drink, & Be Vegan, Vive Le Vegan!, or The Everyday Vegan. Yes, that’s right, Dreena is no newbie to cookbook writing, she has 5 vegan cookbooks on the market! I am thinking this girl knows a thing or two about cooking up some plants. I haven’t met Dreena in person yet, (one day!) but I am sure she must be one of the most loveliest of all people. I remember when I first started blogging, I probably had like 10 followers, one of whom I call mom, and I wrote this post 1 Year Vegan. Dreena came across my story, read it, and tweeted at me that she liked it! Plant-Powered Families focuses on healthy, kid-friendly recipes. I don’t have kids yet, but the inner kid in me (which I sometimes think makes up about 75% of me), was jumping with joy when I received this book. Simple, yummy, easy, and healthy recipes. I’m talking vegan cheesy dips, quick pastas, veggie burgers, sloppy joes, fries, pudding, cookies, granola bars. All things kids (and I) love, and all things made with health in mind. Applause please. Every recipe is whole-food plant based, meaning no oils and minimal processed foods. Healthy is the name of the game! Foreword by Neal Barnard, MD, one of my favourites (nerd alert #2). Recipes that kids will like but are actually GOOD for them. Have your cake AND eat it too. Dreena has written notes and tips throughout the book, to help you get the best results for each recipe. This book is so much more than just a cookbook, there are sections on: Prepping Your Kitchen, Picky Eaters, School and Lunchbox Solutions, Tips for Hosting and Attending Kids’ Parties, DIY Staples, Cooking Guides, and Meal Plans. Basically, whatever question you may have about raising a vegan family, I think Dreena covers it. I’m definitely holding on tight to this book for my future. Some recipes contain some difficult to find ingredients such as white chia seeds, coconut sugar, kelp granules. You can generally find these products in health food stores or order them online on Amazon. Some of the breakfast and dessert recipes contain Vega brand name products. I have no problem at all with Vega, (I have some in my cupboard now) but not everyone may have access to it. If you are raising a vegan family, or plan to in the future, this is the perfect book for you. It’s not just the healthy, kid-friendly recipes that make it a great find, but all of the information and advice from this experienced vegan mom make Plant-Powered Families a must have. Get your copy of Plant-Powered Families Here! To test out the cookbook I made three of the recipes. The first I tried was the Creamy Fettuccine. 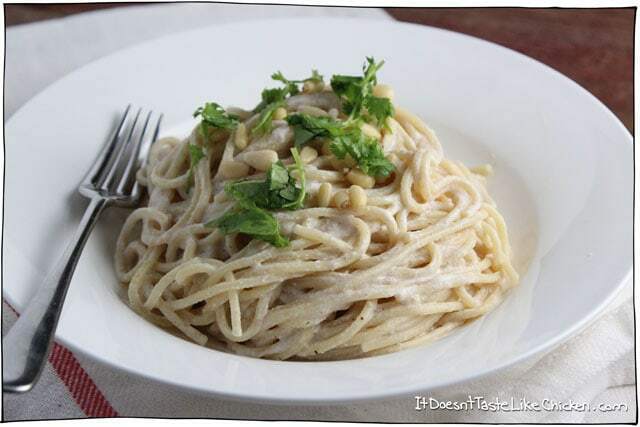 I am always amazed at how many ways you can make a creamy dish in vegan cooking. This recipe is made with a mixture of almonds and cashews. The result is a light, creamy, mild, satisfying, easy to devour the whole bowl in 14 seconds kind of dish. Yep, totally had this twice in a row. The next recipe I tried was Tofu in Cashew Ginger Sauce. Dreena gave the option of using peanut butter instead of cashew butter in this recipe, which is what I did, so I guess you could call mine Tofu in Peanut Ginger Sauce. This was a super simple to make, creamy, saucy, comfort food goodness. I loved how this recipe only require 8 ingredients, and that it came together in under 30 minutes. This is a great lazy weeknight meal. The last recipe I tried was the The Mild Cheesy Dip. This was my favourite of the three. A little more complicated with lots of ingredients, but it was so worth it. I made this dip and brought it to a party where it was devoured in point three seconds by vegans and omni’s alike. It was lovely, creamy, cheesy, but what makes this recipe really cool is the secret ingredient. Potatoes! Yes, this is a potato dip. I think I’m in love. Test the recipe for yourself. Posted with permission from Plant-Powered Families by Dreena Burton. Combine all ingredients except salsa in a blender (starting with 1/2 tablespoon lemon juice and 2 tablespoons nutritional yeast) and puree until very smooth. Transfer mixture to a medium saucepan, and heat over low/ low-medium heat for 5–8 minutes, stirring often, until mixture starts to slowly bubble and thicken. Avoid thickening the sauce over high heat because it can cause scorching. Add extra salt/ lemon juice to taste, and 1–2 tablespoons of milk to thin sauce if desired. Stir in optional salsa, and serve! Nutritional Yeast Note: Adjust the nutritional yeast to taste. My kids love the full 2 ½ tablespoons, but adults may prefer 1/2–2 tablespoons. Milk Note: I prefer to use plain, unsweetened soy or almond milk in this cheese dip. If you can’t use nut milks, then opt for soy. Salsa Note: We love this dip with several tablespoons of mild salsa added in. You can also try adding chopped sun-dried tomatoes, minced green onions or chives, sliced olives, fresh herbs, a few tablespoons of chopped jalapeño peppers, or a few dashes of hot sauce to kick up the heat! Previous Post: « Breakup, Friends, & Summer Adventures! My grandkids love my cashew cheesecake! I love making fun shapes out of strawberry, blueberry pancakes. My kids love them. My favorite recipe is vegan chocolate chip cookies! I love making these with the kids and we can taste the dough as we go along! I cant wait to try this recipe from this book! My favorite kid recipe would have to be chocolate chip cookies that my kids can help me make and we can taste the dough as we go along because it vegan!! I would love to have a book with more kid friendly recipes, usually my kids will try anything so I love finding new ideas. 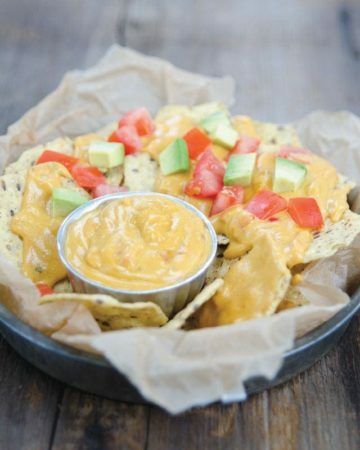 This recipe for the cheese dip looks amazing! I cannot wait to try it! Can you ever go wrong with vegan chocolate chip cookies!? The answer is no. No you can’t. 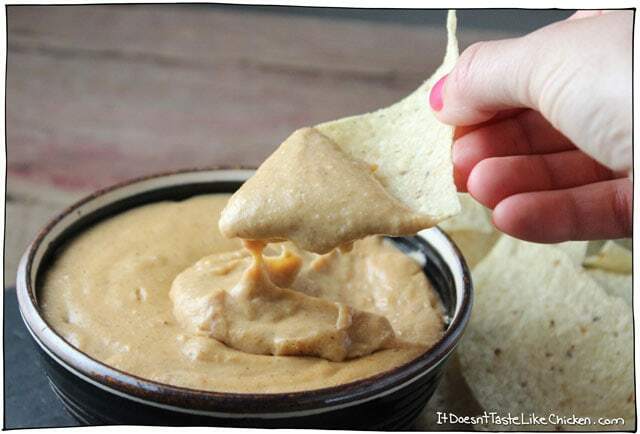 Made the Mild Cheesy Dip this weekend… LOVE it with the salsa added. It was a huge hit with hubby and the 2 year old; as well as the family members we shared it with on Sunday’s family gathering. It was actually very easy to make since you just throw all the ingredients into the blender. I used regular chia seeds; couldn’t find white chia seeds. Thanks for sharing this recipe. You’re welcome Srivani! I’m so happy you loved it too. It’s such a yummy recipe! My favorite kid friendly recipe is cake. But I mean, who doesn’t like cake! Plus I find it’s one of the easiest ways to wow omnis with vegan food. Absolutely, who doesn’t love cake!? Definitely my morning green smoothie! I have wanted to go vegan for years but never have. I have recently decided to go for it! I stumbled across your blog on Pinterest. I love it! You have so many great recipes! I don’t have any little ones, so I would love to win this for one of my girlfriends who just had babies! Thanks for the chance to win. Anything with noodles is usually a hit. Tacos! Kids love to make their own tacos and be able to customize their toppings. Plus they’re delicious! I think any meal where you can customize it, is always more fun! Our 2 year old daughter loves her PB&J, noodles, noodles and oh, yeah, more noodles (with sauce, without sauce, Mac & Cheez, sometimes just coconut oil and homemade vegan “parmesan”), grilled Daiya cheez sandwich; and she absolutely LOVED the vegan meringues! Oh, and I made no-bake energy balls from OSG website – She is still asking for “more energy ball, please mommy!” (so, I will make more!). Looking forward to trying this Cheesy Dip – I think it’ll be a hit! I hope my local library has this book soon so I can check it out. Oo I have never done that before, interesting. I can’t wait to try this cheese sauce. I love the look of this cookbook and the ease it seems to have. It’s a pretty cool cheese dip! I love that the based is potatoes, it makes it so light and healthy! Thank you Eve-Marie! I love that recipe too, I make it all the time. Omnomnom! My little guy absolutely LOVES Buddha bowls! He’s only 16 months but will totally ask for more even though I’m pretty sure he’s full, haha. That and bbq soy curls with homemade sauce. Lots of votes for mac and cheese here! My kids love homemade vegan Mexican food! My 3 yo son loves sprout sandwiches! Sprouts, vegenaise, and a sprinkle of nutritional yeast on whole wheat bread. Wow, so healthy! Great to hear of kids craving sprouts! My almost three year old loves smoothies! I can never get enough smoothies!! I really love a good vegan mac and cheese. My kids are pretty much grown but they still enjoy vegan mac and cheese. You aren’t the only one, there have been several votes on here today for vegan mac and cheese! I’m blessed with two kids who have always enjoyed eating pretty much everything but lima beans, lol! I’d have to say one of their favorite and simple meals to this day is a chickpea salad sandwich. That’s one of my go to meals as well!! I need to get myself a donut pan immediately! Strawberry chia seed jelly is soo soo good. I could make it every day! I am so lucky, to have kids who like simple foods. Especially my son. He’s five. He LOVES my oven-baked “french fries”, whether they’re white or sweet potatoes, and has a deep abiding love for broccoli for a few years now. We throw lots of foods into a bowl, usually, so dinner will be slow-cooked beans (black or black eyed peas usually), rice, broccoli, roasted squash, and chips and salsa if he wants, with banana for dessert. He eats a ton but at least it’s good food. Sorry to talk your face off! lol I’m passionate about food and excited about this book! Cannot believe the dip is made of potatoes, I have to make it! Like you, I have no kids, but am a kid at heart. I love kid food. I like my food simple. My favorite “kid food” would be chocolate cherry smoothies. Yum! I have a cherry smoothie almost every morning, and now I am definitely going to make tomorrows a chocolate cherry smoothie! I work for a vegan home daycare in Bellingham, Washington – our little ones will pretty much devour anything with chickpeas. We do vitamix hummus, oven roasted chickpeas, Chickpea curry rice dishes for lunch sometimes, those go over pretty well. I think my boss and I would love some new ideas for tasty things to feed the little monsters! a vegan daycare!? That’s amazing!! I also agree with the kiddos, chickpeas are always a good idea. I’m childfree by choice but we still love to eat ‘kid’ recipes! I’ve been enjoying carrot hot dogs! Oh I haven’t tried those yet! I keep meaning too… I will one day soon. When I was a kid, I loved making and eating vegan pizza… Still do. More votes for pizza, everyone loves pizza! So good. My son is now 19. He’s autistic, so he’s never been all that typical, not even when it comes to food. For instance, he loves mustard with his french fries and used to drink pickle juice. But he has always been a pizza lover, and that has not changed since we gave up the meat and dairy. One can never have enough quality vegan cook books! 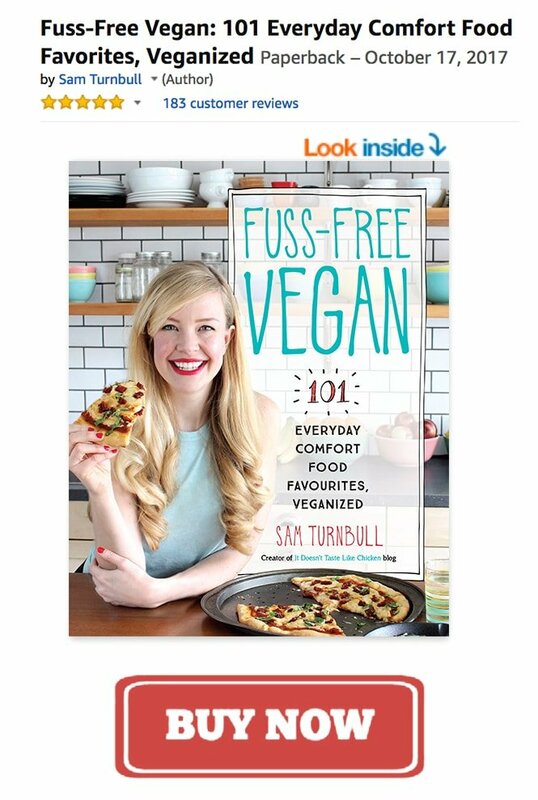 This one looks really really delicious – there is so much delicious vegan food – enough to feed armies of kids! I think my favorite kid recipe would be a good chocolate chip oatmeal cookie. (My husband’s too). I agree, you can never have enough vegan cookbooks! You should see my ridiculous collection! Haha. 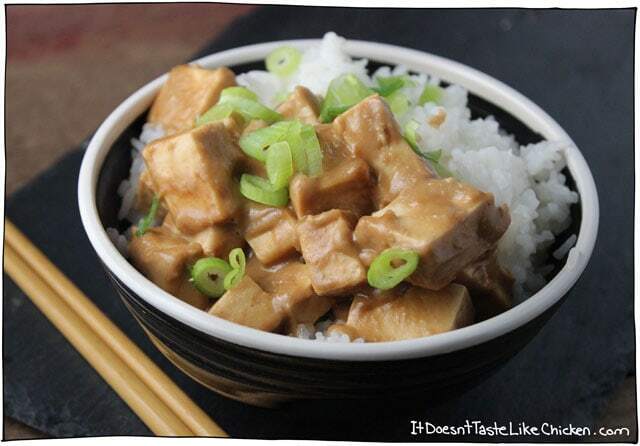 this tofu in cashew ginger sauce looks delicious! It is! And so simple. I don’t have kids (unless you count my 47 yo husband) but AS a kid I loved mac n cheese. That has not changed. I think most kids feel the same!! Yes, every now and then I will make myself a big pot of vegan mac and cheese. Such great comfort food. My kids’ favorite vegan dinner is actually Dreena’s “No-Fu Love Loaf”! Thanks for the opportunity to win this book, as it’s really hard to afford all the great cookbooks that are out there!!! You’re welcome Johanna! Best of luck. You’re kids have great taste! Oooo, now I want that. my nephew and niece love it when we make the peanut butter oatmeal balls for them to snack on! I have four kids (2 are teenagers) so I do a LOT of cooking. Half of us are veg and half vegan. My husband likes to call certain meals home runs, meaning everybody liked it. Home runs for us are salt and pepper tofu, home made pizza, mac and cheese, nachos, veggie burgers and fries. Oof so many carbs. I love that you have such a large veg household Becky! Such an inspiration. Love affair with avocados and my 9 soon to be 10 yr old son has learned to love them as well. Our favorite is avocado, raw chocolate, chia pudding. YUM! Oh yes, I have tried that! So insanely creamy! For now my 11 month old will eat anything! Especially messy stuff like pasta!! I feel my next step up as a mom will be to start being ready with vegan snacks on the go. My 18 month old loves about anything in patty form. Bean burgers, fritters, falafel, and the like. I’m trying lots of other things, but it’s really hit or miss! Hard to go wrong with any kind of patty! All of those sound amazing!! Vegan lasagna, with lots of roasted veggies! Why haven’t I made vegan lasagna yet!!?? 🙂 It’s really something. I’ve made it with roasted tomatos, roasted aubergines, oh well, everything roasted is better! Haha roasted veggies are amazing! My favorite kid-friendly meal is Mac’n Cheez made with potato & carrot ‘cheez’. Yum! Thanks for sharing Val! Agree! Comfort food for the win! This book should definitely help you! I have been vegetarian for many years, some of my kids are now vegetarian and my oldest is thinking of becoming vegan, it would be wonderful to have a great vegan cookbook! We are lucky that these days there are so many great vegan cookbooks to be found. This one is for sure a good pick. So simple, but ants on a log… It’s plant based, has veggies, and is delicious! I still occasionally make ants on a log for myself… see, still a kid on the inside. Haha. Hopefully there are some easy healthy desserts in there! Yes, there are puddings, cookies, bars, popsicles, and cakes!